Walks a couple of pre-determined places, from mostly anywhere. I've only mapped out general routes, this is a WiP and I'll be adding to it just about every day, if you notice any major holes, or if there's any places I put the nodes too far apart (I've found a couple of these in the Lumbridge area) then please let me know so I can fix it. Other than that this script can walk from Yanille to Lumbridge, the only time I've seen it have any issues are in White wolf mountain. Please let me know if you have any issues or requests. Display what's currently mapped out so people can request new areas. When I start the script at Al Kharid and selects Grand Exchange, it walks me towards the gate to Kharidian Desert. Stops at the gate and keeps clicking it. Al-Kharid may not have been connected yet, I'll check it out really quickly. Have you noticed any other issues? 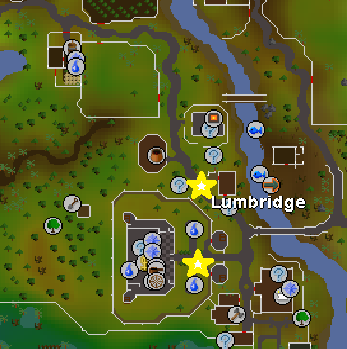 In the next update the entirety of Al Kharid should properly work, and the gate connecting Al Kharid to Lumbridge will be useable and it'll only be used if oyu have 10 gold coins. If you encounter any issues don't hesitate to hit me up! Most teleports should work properly. Note that I didn't know all of the potential choices for teleports, I maybe (definitely) sone. I just realized I didn't do pisc or any of the scroll teleports. If you'd like these, please let me know, or if any teleports are wrong. I know I fucked up some widgets. But most/all teletabs and spell teleports work. As do ring of dueling and most amythest jewelry. Hangs when walking from Lumbridge to GE. Can not proceed next to wheat fields, because the chunk with the position it wants to go to is not loaded yet, so it just stays in place until you manually move him forward a few tiles. im hoping you will update, i walkin with an hc ironman and i really need an up2date walker. Works again now, not sure what was wrong. Lumbridge to GE it kept running back and forth between those points I marked below. Otherwise it worked flawlessly after I interfered to get it past those points.